As I start my second week off the grid, I decided to dedicate this week’s writing to the creatures we share the planet with – and my favourite animals I’ve seen while travelling. As a young child, I remember taking the ferry to Vancouver Island, and in the 1970s, whales still used to appear to the passengers on a regular basis, surfacing in the Pacific Ocean, curious to see the ferry as the passengers were to see them. 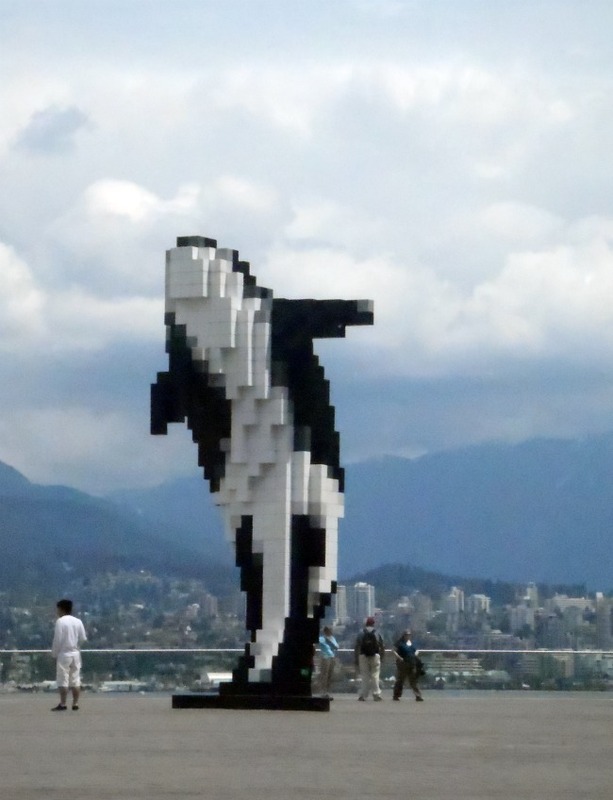 And in British Columbia, we’re very focused on many ocean creatures – even a local artist has tried to capture the beauty of an Orca in downtown Vancouver in a modern sculpture. (left). Travelling with my friend to the Canadian Maritime provinces, we took a whale watching excursion while on Cape Breton Island and were treated to seeing pilot whales, who frolicked, much to our collective delight. I’ll always remember two teen boys, who had been dragged onto the tour with their parents, who transformed from sullen, bored boys to excited and engaged like the rest of us on the mere sight of the whale’s fin surfacing from the ocean. Another my favourite memories was my third sighting of whales in Canada, in the St. Lawrence estuary. This mighty river meets the Atlantic Ocean off the coast of Quebec, in an area called Cote Nord. From the small town of Tadoussac, tourists regularly set out in the boats to see whales, and although I had seen whales before, it doesn’t diminish the excitement to see these amazing creatures once again. As we crowded along the edges, we were soon rewarded by the distant sight of a whale, and the same excitement ran through all of us, that utter thrill of seeing one of the world’s largest creatures come up to check us out. From coast to coast, I’ve had the luck of seeing whales, from orca to pilot to blue, and I’ll never forget that moment when a fin decides to break the surface and adults and teenagers become the wondrous kids we all once were.